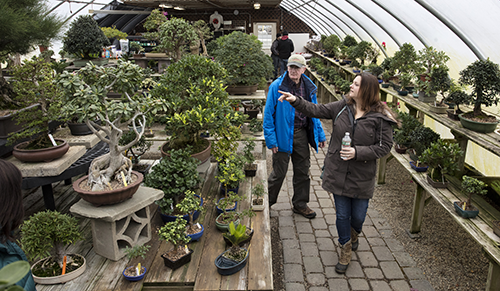 Welcome to Bonsai West, New England’s premiere destination for the Bonsai enthusiast. Founded in 1982 by Michael Levin, this year-round nursery features one of the largest collections of historically important Specimen Bonsai outside of Japan. We’re located on two acres of New England farmland, in Littleton, MA. A 250-year-old farm house overlooks our outdoor bonsai garden and gallery, our five greenhouses and teaching/demonstration areas. We cater to both the complete beginner as well as the advanced student/collector. Our Greenhouses are always filled with a large selection of indoor tropical bonsai, and our outdoor garden houses some of the oldest and most beautiful bonsai available anywhere in the country. We have a vast inventory of starter trees specifically cultivated as pre-bonsai stock plants, for you to create your own bonsai. You will find quality Japanese tools and soils or that special handmade pot in our large Pottery House. The Bonsai West School offers classes that range from a three-hour Introduction to Bonsai all the way to Advanced Master classes. If you are hoping to fall in love with your first bonsai or add a fine specimen to your collection, or are simply stopping in for a quick tip on pruning and care, we are always here to show you around. A visit to Bonsai West is a must for anyone interested in exploring this fascinating hobby.